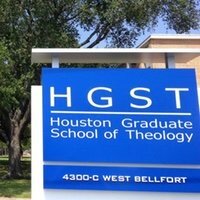 Founded in 1983 specifically to provide theological education for those in the Evangelical Friends Church (Quaker), Houston Graduate School of Theology has since evolved to offer graduate theological education for students from a wide denominational background, especially those who are considering the ministry as a second career. Fully accredited by the Association of Theologica Schools (ATS), HGST has positioned itself as a school that is at once evangelical, multicultural, and multidenominational. HGST offers numerous master's-level programs as well as a Doctor of Ministry degree. Students may pursue an MDiv as well as an MA with concentrations in Theological Studies, Spiritual Direction, Missional Leadership, and Counseling. Students in the counseling program may also pursue programs that put them on track to become either a Licensed Professional Counselor (LPC) or Licensed Marriage and Family Therapist (LMFT). Students in the Doctor of Ministry program may emphasize Missional Leadership, Pastoral Care, Pastoral Leadership, Preaching, or Spiritual Direction and Formation. Because of its size and lack of dedicated facilities, HGST does not offer many of the amenities that several larger schools can offer. You won't find a recreation center, student apartments, or even a cafeteria. However, you will find a vibrant, diverse, and welcoming community devoted to studying and sharing the gospel of Christ. Students and faculty alike are committed to fostering the rich diversity amongst the student body and ensuring that all students are equipped for real-world ministry upon graduation. As a graduate school of theology located in Houston, students still enjoy access to one of the United States' largest metropolitan areas. There are ample opportunities for recreation and education in the area. Students and their families may explore the Space Center, Fine Arts Museum (largest in the Southwest), and numerous other museums and cultural centers, from the Houston Museum of African American Culture to the American Cowboy Museum. The Houston Museum of Natural Science and Houston Zoo are also popular with students and their families. And if it's sports that you enjoy, Houston sports professional teams in baseball, football, basketball, and other teams as well. Since HGST is part of the campus of Willow Meadows Baptist Church, the school currently does not offer on-campus housing. However, numerous housing options are available in the greater Houston area, from small apartments for single students to homes to rent for students and their families. According to HGST, approximately 60% of the student body receives some form of financial aid. Students may receive federal student loans, grants, and scholarships. The primary form of financial aid is student loans, and students are encouraged to apply early. There are a handful of scholarships available, awarded both in the Fall and Spring.